The Tatami Bed. Tatami beds are platform bed-frames that are designed to have a tatami mat inserted on the top. 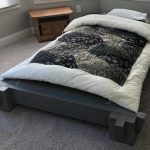 The advantage, of course, is that they’re higher up and easier to get in and out of, and also, there is an aesthetic aspect to having a bed-frame that some prefer. This entry was posted in futon, real Japanese futon, tatami beds and tagged tatami bed, platform beds, futon beds, tatami beds, futon on April 29, 2018 by Y Hasegawa.